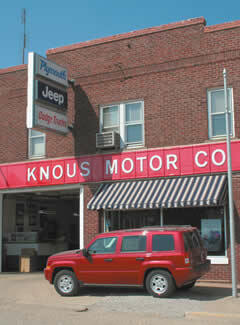 Knous Motors Home: Your Petersburg Illinois Dodge, Chrysler, and Jeep Dealer! Knous Motor Company, Inc. is a Dodge, Chrysler, and Jeep automotive dealership that has been serving Central Illinois for over 76 years. Our business is located in historic Petersburg, just 20 minutes northwest of Springfield, Illinois. Originally surveyed by Abraham Lincoln, Petersburg is the County Seat of Menard County, IL. Knous Motors is the only new-car and new-truck dealer in Menard County, Illinois. We carry the full range of new Dodge, Chrysler, and Jeep products, along with a wide selection of quality pre-owned vehicles.